Check out the new SAFE Treatment Locator! 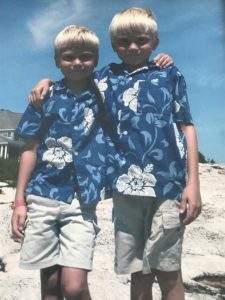 “The siblings in a military family are really the only life-long friends these kids will have growing up,” says James Winnefeld III, “LJ” to his family and close friends. Jonathan Winnefeld was the youngest son in a military family. His father, James Winnefeld, a Navy Admiral and the ninth Vice Chairman of the Joint Chiefs of Staff. His mother, a military family advocate and a respected voice in the veteran and military community. His brother, following in his father’s footsteps at the United States Naval Academy. “Our entire family has served. I think Jonathan saw [becoming an EMT] as his way to contribute to that legacy of service,” says LJ. Jonathan was an introverted child, which evolved into anxiety and depression issues as he entered adolescence. As his family worked with doctors and counselors, trying to help Jonathan, he began to self-medicate. Even with a family as actively involved and supportive as the Winnefeld family, there was no cure for addiction. After a long and difficult struggle, Jonathan had a seminal event, and entered in-patient rehabilitation. When he was released, he got his EMT certification and was excited to start his Freshman year at the University of Denver. For his freshman essay, he wrote about working to save a man who had overdosed, and how it had changed his life forever. Unfortunately, that wasn’t to be. Jonathan was found unresponsive in his dorm room just three days after his parents dropped him off at the University of Denver. An open-air heroin market close to the college, a critical blow to Jonathan’s recovery, and he died of an accidental overdose of heroin laced with fentanyl. “The temptation was too great. He knew he was struggling, he knew he had a problem, and he knew there were a lot of people out there like him. He wanted to be able to help those people, to save lives. Jonathan’s story is a testament to that. If we can save one family, one person, that’s all that matters,” concludes LJ. This epidemic has given us one common experience: we have all become experts in our own way. At SAFE Project, we believe that we strengthen one another by sharing our stories. Whether you are in recovery, lost a loved one, or are making a difference in your community, you can help others on this journey. We'd like to hear from you.